Description: Heavy-duty modular design, with side bands, separators, and hinge-opening (MK) or twist on/off (ME) carriers constructed from high strength, glass-fiber reinforced nylon. Due to the unlimited possibilities of frame stay designs and widths, snap on or hinged access bars, five size variations (0320, 0475, 0650, 0950 and 1250), more than sixteen mounting configurations, replaceable glide shoes, and a completely modular design; VARITRAK SERIES ME, MK, & MT represents the world's broadest, most complete state-of-the-art extremely high strength glass reinforce nylon and aluminum cable and hose carrier line. 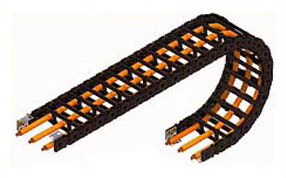 VARITRAK SERIES ME, MK, & MT allow users to incorporate an extremely strong, rigid and lightweight carrier. Since this carrier has been designed using the latest design techniques (FEA, BEA, FMEA, Computer Mold Modeling, Statistical Sampling, etc.) the user is assured of consistent quality, durability and world class performance.